Bruce Peak was named for Bruce Clark who died in 1984 in a fall on the north face during an alpine rescue practice on the mountain. Bruce was an experienced and talented climber who had contributed much to New Zealand climbing and Search and Rescue. His death starkly illustrated that mountains can be both beautiful and dangerous places. We had just finished a double rope lower and had packed up the gear, safety line last. It was warmer, the sun had shone for a while and it had stopped snowing. But as we moved to safe ground along a large sloping ledge, a gust of wind blew me off balance and I clutched at the low scrub. Then Chris screamed, 'Bruce, Bruce, Oh my God, Bruce!' and I turned to see a flash of blue fly through the air. Bruce was falling, rolling and tumbling, cartwheeling and turning, like an astronaut on a weightless space walk, only there was no lifeline. Suddenly it was cold again; Bruce was gone. Simon Cox, New Zealand Alpine Journal, 1985. The Logan/Main Temple Stream North Branch access route opens the area up for day trips. 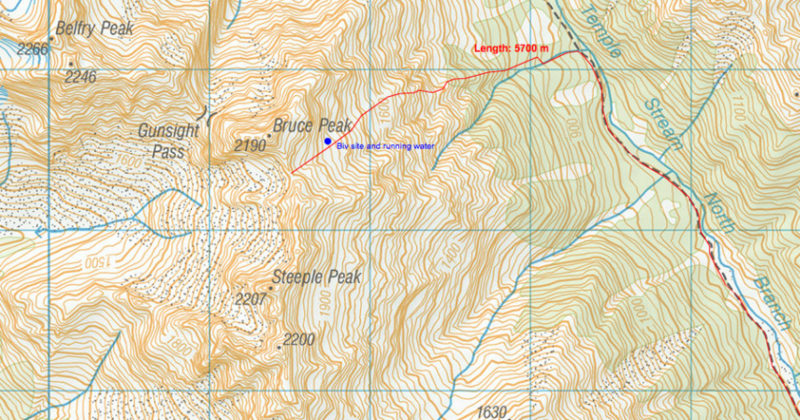 Allow 3-4 hours to the saddle south of Bruce Peak and another hour to the base of Steeple peak (Weta Prowl etc). Head up the last major side stream (second major side stream crossed) for 200 metres and enter the beech forest on the true left. Head up the spur in the forest which gradually steepens, avoiding any thick undergrowth on the spur by keeping to the true left. A very short scrub bash brings you to a scrubby knob (see photo). From here climb the bluff directly above moving diagonally right up through subalpine scrub and into a scrub filled gully. Go up the gully onto a spur, then ascend again for 100 metres up and out to the true left onto the tussock ridge. Follow the ridge to its end where there are small open bivy sites for at least 6 people. Running water can be found in the gully on the true left. There is another potential bivy site 150m to the east with a water trickle off a cliff. From the bivy it is 30 minutes to the col (2000 metres) between Bruce and Steeple Peaks, and all routes on these peaks. Approximately 3 to 3.5 hours from the Temple Shelter to the bivy site. Alternatively access via Temple Stream South Branch (about 8 hours). See Steeple Peak description. The most obvious ascent route is up the north rib, following a line just east of the prominent buttress which runs down toward the North Temple Stream. Angle right up an exposed bench to gain the west ridge then cheval along the ridge until easier ground leads to the summit. Pitch1: start on the right hand side of the snow slope, around 6 meters traverse then straight up to the face. Grade around 15. length: 60 meters Pitch2: Keep straight up on the face. Grade around 16. length 60 meters Pitch3: keep following the crag and keep yourself on the face. Grade 16. Length 60 meters. pitch4: still keep climbing on the face, little bit slab. Grade 17. length 60 meters. pitch5: start traverse to the ridge it's very short the length around 25 meters. Grade 15 Pitch6: keep straight up around 10-15 meters then keep climbing on the left. Grade:17. Length 60 meters Last 200 meters we decided short roping plus ruining belay. grade around 13-14. Ascend the prominent south western buttress from its lowest point in the mid South Temple. Sustained grade12-14 climbing. 500m height gain on excellent quality rock. Descent via Bruce -Steeple Col.
Starts up S-shaped crack on buttress to the right of Butterfly Buttress. Follow crack (3 pitches, 17, 16,14)to crest of buttress - easy ground (10-12) to notch to cross Butterfly Buttress. Route wanders up easy ground (10-12) to snowfield in middle of face between Kea and Butterfly, then up 17 corner and onto easier ground to summit. About 12 pitches due to wandering nature of route. About 400m of climbing. Surprisingly decent rock.